Landfills, E-waste piles, and ocean garbage patches are a part of our world we’d rather not see, but these eyesores aren’t going away. Rather than simply accept that our planet is being swallowed by garbage, one artist has started turning this discarded junk into something beautiful. 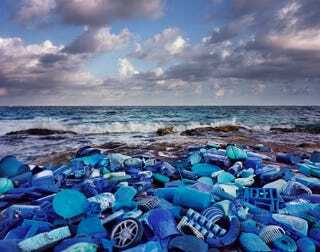 The landscapes shown here are the work of Alejandro Duran, who has spent years collecting countless bits of plastic trash along the coastline of Sian Ka’an, Mexico’s largest federally-protected reserve. By creating aesthetically pleasing arrangements from an admittedly depressing media, Duran’s Washed Up installations seek to raise awareness about humanity’s ever-growing encroachment on the natural world. Over the course of this project, I have identified plastic waste from fifty nations on six continents that have washed ashore along the coast of Sian Ka’an. I have used this international debris to create color-based, site-specific sculptures. Conflating the hand of man and nature, at times I distribute the objects the way the waves would; at other times, the plastic takes on the shape of algae, roots, rivers, or fruit, reflecting the infiltration of plastics into the natural environment. More than creating a surreal or fantastical landscape, these installations mirror the reality of our current environmental predicament. The resulting photo series depicts a new form of colonization by consumerism, where even undeveloped land is not safe from the far-reaching impact of our disposable culture. The alchemy of Washed Up lies not only in converting a trashed landscape, but in the project’s potential to raise awareness and change our relationship to consumption and waste. Plastic is so pervasive and long-lasting that some scientists now think it might be the best “fossil” marker of the Anthropocene, the proposed geologic epoch where humans and machines steer the fate of our world. Whether or not we’ve entered the Anthropocene is still a matter of scientific debate, but if we needed a powerful mental image of what alien geologists might dig out of the ground in the distant future, here you have it. They’ll probably wonder why all the plastic-shelled organisms went extinct. All images were reproduced with permission of Alejandro Duran. You can check out more of Duran’s work on his website and Instagram.